Good Morning, hope everyone had a good weekend. Thanks for all your lovely comments on my last post and welcome to my new followers, it's lovely to meet you. I thought I would share a little bit of inkiness today, these are ones I made a few weeks back when I was having a play as you do. There's definitely a bit of a cow thing going on here, when I made these I had just received some new stamps from Sutter Stamps and the cows were amongst those so itching to get inked up. Both of the backgrounds were created with Glimmer Mists, it's not something I do that often for my scenic cards but I quite like the mottled sky effects and then I added distress inks to obtain some depth to the meadows. The stamps in both are a mixture of Sutter and Stampscapes with a few Art Impression thrown in for good measure. The fence in the top card is Sutter and the one on the bottom card drawn in by hand. OK, off to do some proper work now, have a good Monday. This week we would like to see 'Anything but a Card' at Allsorts so lots of scope there from tags to gift boxes, cakes to scrapbook l/o's. This weeks sponsor is DigiDarla. I had a few ideas but in the end decided to hijack the mint tin hubby keeps on his desk and give it a makeover............I will add at this point that he does appreciate flowers and said he can live with it in it's new format, even if it's not overly practical for a guys desk. The stamp I have used is Dogwood from Hero Arts which I stamped onto a circle which I first inked with distress inks olive and marmalade and stamped with Hero Arts H2365 Old French Writing as well as a little stamping round the edge with a crackle stamp. I coloured the flowers with watercolour pencils and decoupaged and finally added some matching ribbon around the edge of the lid. I also have a second share, a little gift bag which I made using the good old scoreboard, some ribbon and an image from one of this weeks sponsors DigiDarla which is called Poppy Oval. 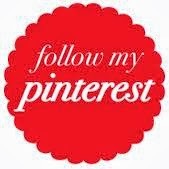 Our other sponsor this week in Pin and Tack so a double reason to join in this week. 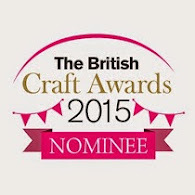 I hope you will join us this week and look forward to seeing all your lovely creations. As always my thanks for all your visits and lovely comments which are always greatly appreciated. I am pleased to announce that Elly (Wednesday comment) is the lucky winner of last weeks candy, please mail me with your full postal addy so I can post it off to you. And this week I have some more Spring time ribbons and embellishments in pink blossom colours. Hope you all have a lovely weekend and as always many thanks for popping by my blog. Good Morning Peeps, hope you are all having a good week. We still have lovely sunshine here, two days on the trot with my craft room French windows open is unheard of lately, but if the weather man's got it right it will be back to woolies come Friday so better make the most of it I guess. I really could make card with Ruth Tonic Pick of the Bunch products all day, so as I have quite a few in my gallery though it only right I shared a few more with you before I get my head down and make a start of samples ready for the next Stamp Addicts show on C&C.......some really fabby stamps coming up, can't say more at the moment but I will let you have some sneak peeks very soon. 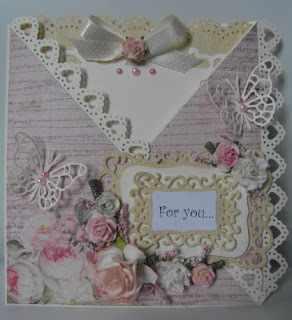 I know from your messages lots of you have recently bought the Punch and Stamp sets and I just know you are going to have great fun using them, they really have revolutionised the ability to create pretty flowers to embellish our cards........thank you Ruth. Have a good Wednesday and thanks as always for dropping in. Morning Peeps, thank you for all your kind comments over the weekend and a warm welcome to my new followers. I do hope you have had a good weekend and got some of the lovely sunshine we had here in the Fens. It's much cooler today but still nice and bright and slowly everything is showing a bit of colour. I was looking back at my blog and saw that I shared some pictures of blossoms in the garden on April 2nd last year, at the moment nothing is anywhere close so we are a good three weeks behind. I thought I would share a couple of the recent samples I made for Ruth using her two latest Tonic Punch and Stamp sets, I will note below each which set I have used. Making the most of the sunshine I managed to get a few photos of the dogs Saturday, not an easy task getting all seven to sit together for any period of time and in the end the best I managed was six of them, with Holly finding a better option indoors as you will see below. Above from left George, Daisy (back) Pixie (front) Lily (back), Poppy (front) and Bernie. 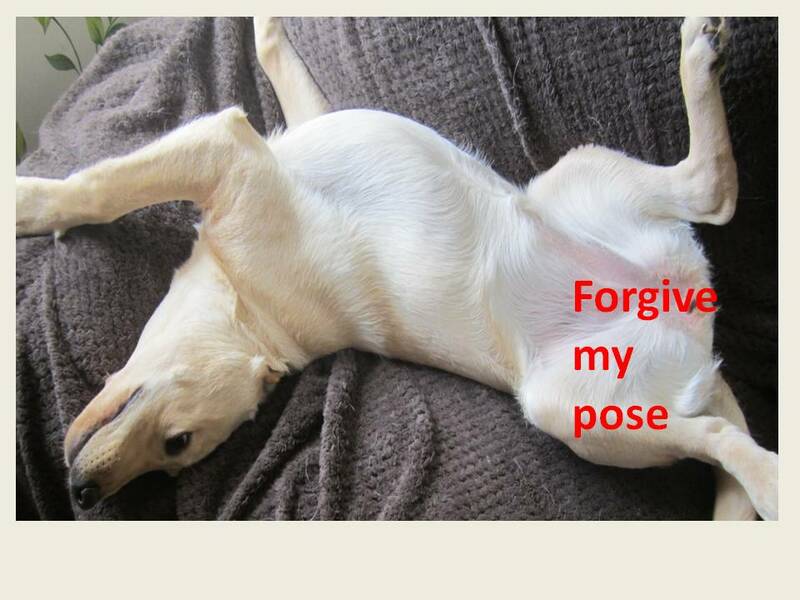 Holly got bored with the photo session and sloped off back to the sofa in my craft room and here she is splayed out in her favourite position. As always my thanks for your visits and wishing you all a good and crafty week. Morning Peeps, this week I am hosting the theme at Allsorts and a few weeks ago I asked the DT if they would like a bit of a challenge themselves, well they seemed up for it so I sent them all a little kit of similar goodies to play with and see what they came up with. Needless to say they didn't disappoint..............not that for a moment I ever thought such a talented bunch would and you really must pop to the challenge blog and look what they all came up with. Here's the kit they all received, the DP's varied slightly but are all DPs' are from the same MME Bluebell range so colours match and as one of our sponsors this week is Ruth from A Passion for Stamps I thought it a nice idea to send all the DT a die from her Tonic Pick of the Bunch range along with some petals to make flowers from her new Punch and Stamp Range (and yes I did send them all a copy of the instructions). 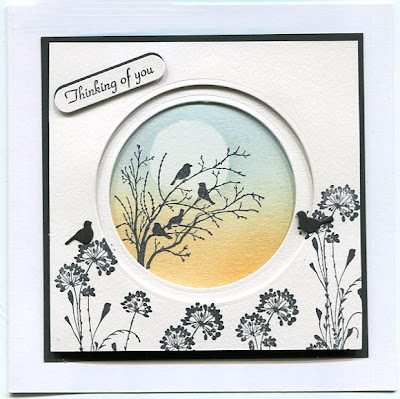 I used the TH fence and arched window and placed over an image which is one of the stamps Ruth created to go with the dies. I also went for pansie, I've probably said it before but I think the little stamps to go with the petals are so clever and make the pansies so realistic. As I told Ruth, praise indeed from my daughter who's not at all into crafting beyond regularly plundering my baskets for cards, but was very impressed with a card she spotted in my craft room using the pansies. And the them is simple 'A Passion for Flowers' so leaves plenty of possibilities for your entries which I looks forward to seeing and our sponsors are A Passion for Stamps and Crafty Ribbons. I also made a second card to use up the last piece of DP from the pad, another of Ruth's dies, an Artistic Outpost stamp, decoupaged the flowers and repeat stamped the little birdies from the bottom of the sentiment stamp to create a row to place across the bottom of the card. And the winner of the stamps from last Saturday is Chris from her comment on my Thursday post, congratulations Chris please mail me with your full postal addy so I can send your goodies off to you. Morning Peeps, just shows my heads been all over the last couple of weeks as I realised last night with a bit of a panic that I had totally forgotten to prepare the mid months posts at Penny Black and More and Stamping Sensations challenges. 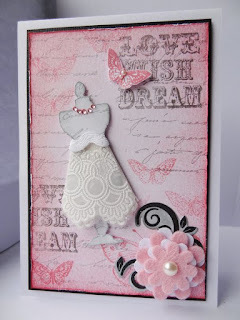 So without further ado here is my share for our Penny Black theme this month of Blossoms and Bows using the Lily punch and stamp set from Tonic, some Spellbinders dies and butterfly, and a Penny Black sentiment. The bow is a little tenuous, it's the thorax of the butterfly, but can assure you it's definitely there. There is still plenty of time to join in with this months challenges where as always we have some fabby prizes on offer. Thanks for dropping in and your lovely comments and also welcome to my new followers. Have a goos Thursday everyone. Good Morning, I don't have anything crafty to share but I have received an awful lot of messages and good wishes both on my blog and by e.mail for which I am most grateful, so think this will be the quickest way to reach you all quickly. Yesterday I saw two more doctors, lots of probing and delving, but the end result is there is "nothing pathologically amiss". We discussed what I do on a daily basis and as my dexterity is poor and hands weak I put excessive pressure on my right arm when I use die cutting machines and they thought that may be partly to blame for the lump in my breast. So apart from being rather sore which is a minor issue by comparison and feeling physically drained from all the fretting, I am more than a little relieved as the last couple of weeks has gone by in a daze. One or two of my DT colleagues came up with their own names for the problem: "Crafters Bosom", "Crafters Chest" and one suggested I might need to take up a less aggressive hobby, but I do feel the excuse for a E.Bosser coming along. I love my Big Shot Express and GC, I had the electronic BS because of my dexterity issues, but of course needed the GC to take the larger dies. I even tried a Big Shot Pro which did all of those jobs but was just too heavy for me to work, so if anyone has experience of the E.Bosser I would love to hear your thoughts as the reviews seem mixed. 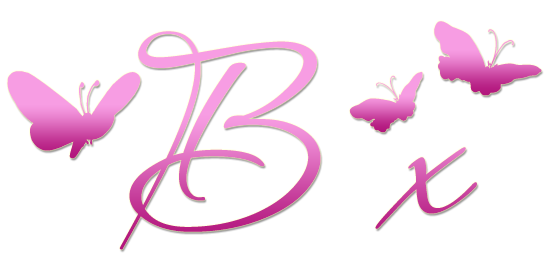 As I alluded in my scheduled post yesterday, I am in the midst of a bit of a health scare of the female variety, hence no blogging the last week, I will hopefully be able to share more later next week. Meanwhile I wanted to share a picture of another of our families athletes, so blessed are we to have so much talent amongst us. Whilst Alex was in Paris achieving his own PB in the marathon there, Zoe was in the Southern Moroccan Sahara competing in the Sultan Marathon Des Sables, a gruelling race said by many to be the toughest in the world covering 251km in six days with one rest day after the longest 75.7km leg over desert and rocky terrain. I should add that they have to carry a 7.5kg backpack with all their food and personal requirements for the whole race. On the final day yesterday, Zoe (right in the photo) found herself in a podium position finishing third lady and 28th overall. I am not totally sure of the numbers, but close to 1,000 competitors finished the race so what a fabulous achievement and we are all suitably proud of her. 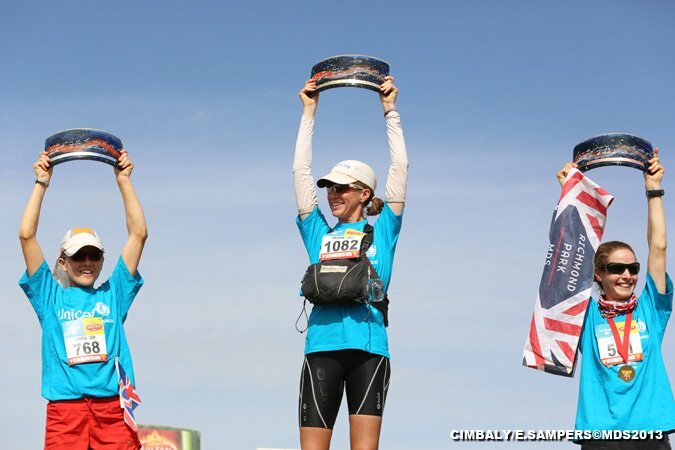 And on Friday she and Alex both head off the Hamburg for yet another marathon ! Have a lovely Sunday everyone, we are promised 19 deg today so fingers crossed they get it right. Good Morning to you all, thanks so much for all your lovely comments and congratulations earlier in the week following Alex's marathon and apologies for the lack of activity and visits since that post, I've had a bit of a health scare this week and blogging has taken a back seat. Fortunately from here on the post was scheduled ready to tell you about the theme Helene has come up with at Allsorts which is something a little bit different, she would like our cards to feature something that begins with the letter of our name, so of course Butterflies and Blossoms came immediately to mind with me. Our sponsor this week is Crimson Cloud. I have used one of the Spring release Penny Black Stamps called Kisses in the Sun, stamped onto a background created with distress inks, Olive, Mustard Seed and Chipped Sapphire with a spritz of dazzling diamond Glimmer Mist. 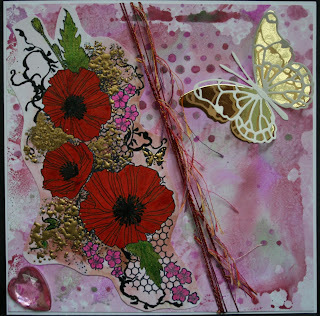 I decoupaged the butterfly and bleached out the colour from the leaves of the image. 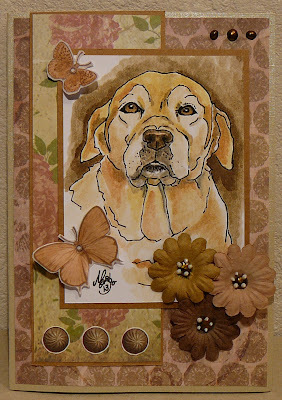 The background is stamped with the same distressed inks using Penny Black Floral Thread. Last weeks candy winner is Carol from my Tuesday post, congratulations Carol please mail me with your full postal addy so I can get your paper pad in the post to you. My second card is J for Jester (and Joy my middle name) and uses this lovely image from this weeks sponsor Crimson Cloud. The background is just a mixture of stamping, the sentiment which I cut into sections in an old wood mounted one with no name I'm afraid and I did some doodling round the edge of the base card, not sure if it works or not, but there done now. I really can't wait to see what you all come up with this weeks theme as it's as I am sure there is going to great variety. 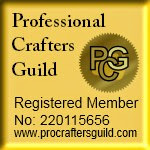 Hello all my crafty friends....................be warned that this is a mega long post................the time has come to announce who has won some goodies from my blog celebration but first of all I want to say how very humbled I feel that so many of you joined in and that it was evident from every one that so much thought had gone into your work. My heartfelt thanks to each and every one of you. I also realised with many smiles reading all your blogs that I am more than a little transparent when it comes to the things I most enjoy in my crafting endeavours and the elements of Nature I draw from everyday life. All of you reflected this in some way in your artwork adding your own personal slant which made each and every piece so special.................doesn't that make crafting the very best form of expression and escapism one could wish for ? You can check them all out here. Anyhow, I need to cut to the chase and announce some names and this is the bit I have found so very difficult. It was my intention to choose some favourite entries to receive the prizes, but it soon became abundantly clear that was going to be an impossible task as I liked them all, so I moved to plan B and reverted to good old Ramdon Org., it seems the only way I could deal with it without heaps of guilt and not including everyone. Please all mail me with your full postal addys and I will post you lucky dip prize off to you. And thank you all for giving me so much pleasure this last month and extending your friendship in such a very special way. Good Morning Peeps, hope everyone is OK and thanks for all your lovely comments and good wishes for our trip to Paris and Alex's marathon Sunday. Not the best of pictures, I grabbed this one as he was taking his jacket off to do another photo shoot, but I should have some of the official ones very soon. The weather was cold but sunny for the marathon and just like London the crowds lining the streets to the finishing line running up to the Arc de Triomphe and Champs Elysees were so supportive of all the athletes from the fabulous Kenyan elite athletes familiar from the Olympics, right through to those who took five hours and more. Asics who were the marathon sponsors and also co-sponsors with Runners World of the competition Alex won had a hospitality suite in prime position right on the finish line and we were invited to watch the race from there, complete with glass in hand so that really made the day extra special. It was also right next to the winners podium so we were able to see the presentations of the winners of the men's, ladies and wheelchair races as well as Alex give his interview which will be on the UK website and in the Runners World magazine where he has appeared the last few months as they followed his training. I can see some more peeps have joined in my blog celebration whilst we have been in Paris so I will be popping round to you all today then after work I will sort the winners draw and hope to post that either later today or tomorrow. 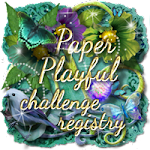 Good Morning all you crafty Peeps, another scheduled post with our new challenges at Stamping Sensations where our theme is 'Special Occasions' and at Penny Black and More where we have 'blossoms and Bows'. My Penny Black and More DT piece which is the top card is an order from my daughter for a leaving card for a teacher colleague and she specifically wanted me to use this PB sentiment, it had never occurred to me before to use it for that type of card but it is actually quite appropriate. She also wanted a simple but stylish design and a large card as all the Humanities department need to sigh it, so it's a 10x10 with a matching box. I started by stamping and embossing the PB blossom stamp and then cutting round some of the blossoms so that I could place them over the edge circle nestie to they stayed intact before cutting the aperture. 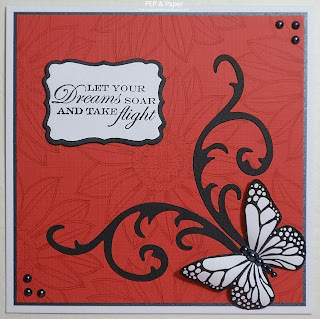 The background is shaded with Pan Pastels and the PB sentiment stamped and embossed in black. I added a little colour to the image and then some small punched flowers and as it's a 'special' card used swarovski crystals in the centres. I have two DT pieces for Stamping Sensations, the first above uses lots of lovely poppy stamps, the one in the aperture is Penny Black and the ones around the frame which I stamped and then cut round so they go into the frame is a Clarity stamp, one of the very few from them that I own but this one was a must have. The flowers are all coloured with Pan Pastels and the sentiment is computer generated. My second Stamping Sensation piece is a bit of die and flower indulgence really. The base piece is embossed with one of the new A4 size Spellbinder embossing folder which are so useful without all the faff of lining up patterns with the smaller ones. The central mats are more Spellbinder dies (details to all on the thumbnail links below) and the flower made with Ruth's Tonic Pick of the Bunch stamp and punch set. I really hope you will join in with our challenges this month, as always we have some fabulous prizes on offer.